After finally sleeping through a New Zealand night, we woke up at 645 AM New Zealand Time on Monday morning (Sunday in the States as they say). It was 1145 AM Shreveport time. But, I slept for eight straight hours without waking up and I felt like it was truly early morning and not nearly noon! I was almost acclimated to being down under! I have to stop for a moment to digress. We are down under. I don’t recognize the stars. The water swirls the wrong way in the toilet. And, it gets warmer the further north you go, not south! Also, sitting in the front seat of the minivan whilst Grant or Alex bustle about this metropolis known as Auckland can be a bit disorienting. They drive on the other side of the street here and every time we turn, I panic because I think we are heading into traffic going the wrong way! Also, you have to train yourself to look to the right for oncoming traffic before crossing the street. We loaded up the luggage and left one hotel and drove downtown toward Auckland on the “motorway” to our final hotel our last day in this city. Our room overlooked the harbor but we set out toward downtwon for Victoria Market. Little did I realize that what was to be a simple walk to the bank to exchange US dollars for NZ dollars and then on to the marketplace would be such a challenge. Why? It was uphill. Both ways! 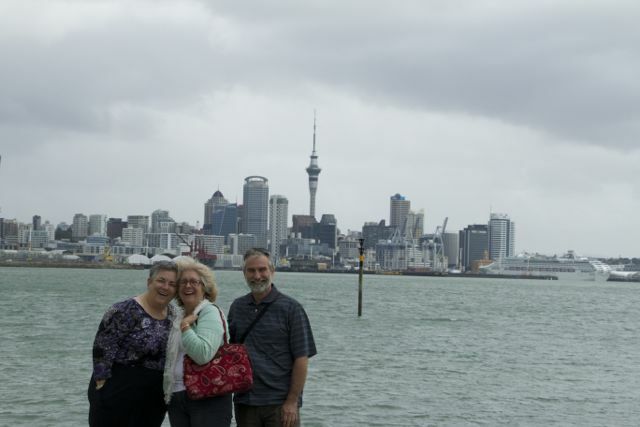 Seriously, we walked about a mile up a steep incline through downtown Auckland surrounded by tall buildings and bustling citizens. We paused at the foot of the Sky Tower and were relieved to see that the next mile to the marketplace was downhill. 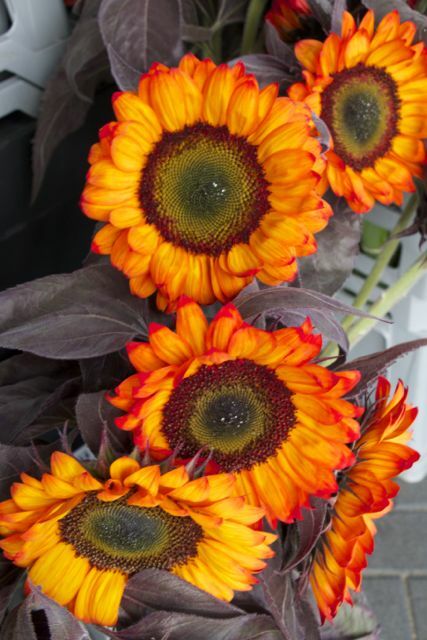 But, when we arrived at what was once a busy, bustling marketplace filled with small shops, we discovered that the economic downturn (global it seems) had forced most of the shops to close. It was still a nice experience shopping but now we had to walk back uphill to the Sky Tower. 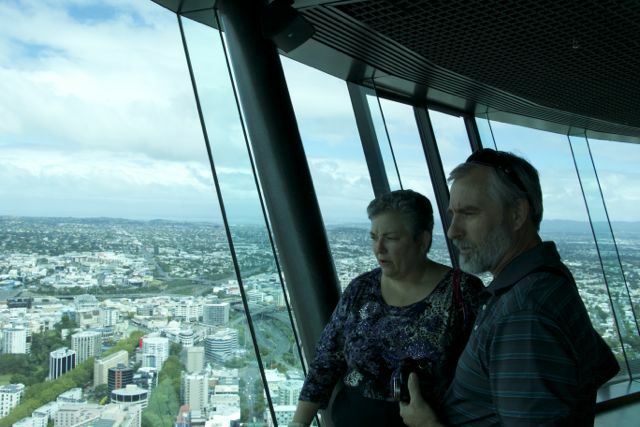 By the time we reached the base of the Sky Tower, both Sherry and I were exhausted. In spite of getting plenty of sleep, it seemed our bodies were lagging behind our relatively rested minds. Alex refused to take the elevator to the top of the tower (at least she admitted a fear of heights) but Sherry, Grant, and I bravely soldiered on. I pause for a moment to comment on what I can only assume is a prelude to insanity. We passed a gift shop on the way down an escalator to the ticket counter. Hanging from the ceiling of the gift shop was a mannequin dressed in blue overalls, arms outstretched, hanging from a cord. Grant pointed it out to me and told me there was a free fall from the tower on a vertical sort of zip line if I was interested. I have never jumped out of a perfectly good airplane or off of a perfectly good building! I did not plan on changing that record! So, here is a picture of the Sky Tower from street level. Next is the platform at the base. 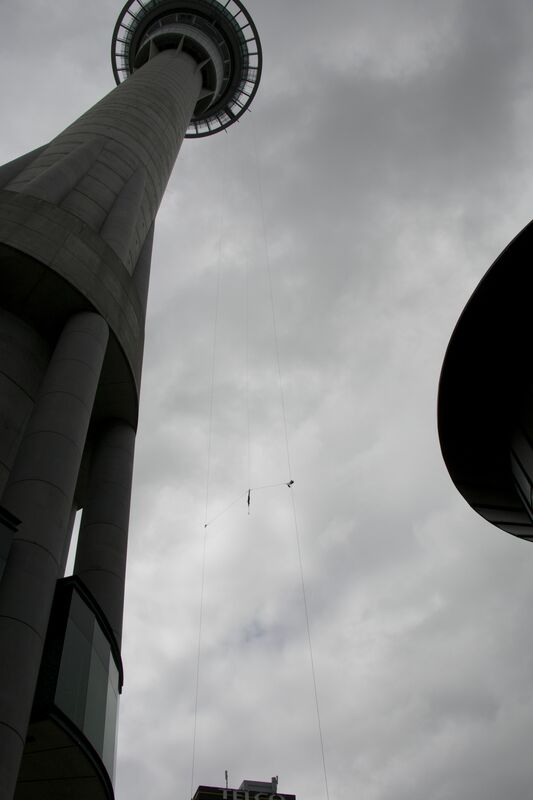 A person is clipped into this vertical wire assembly and quickly pulled up to the top of the tower. Then, the person is released and plummets to the ground. All very controlled, of course. 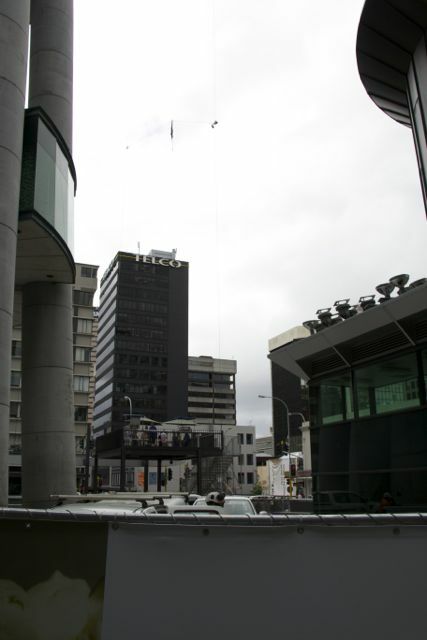 The third picture shows the harness on its way back up without a person clipped in. I watched one young man land on the platform and the way in which he was walking, hunched over and stiff legged led me to believe he should have been wearing Depends. It would seem he had, shall we say, “soiled himself” as Alex commented. Not a reliable cure for constipation, I would conclude! 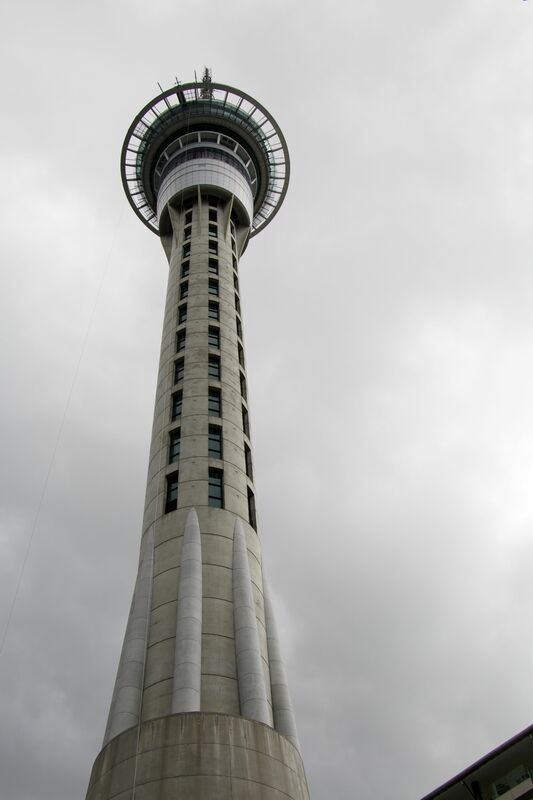 The Sky Tower from street level. 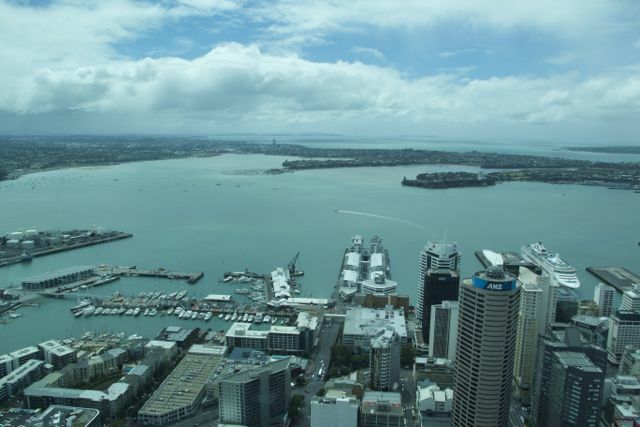 Here are some pictures from the top of the Sky Tower of Auckland and the harbor area. The many hills you see not covered by buildings including the largest across the harbor are relatively young volcanoes that shaped Auckland. Also, there were glass panels in the floor allowing one to look downward at the ground and to contemplate the overwhelming mastery that gravity has over our lives. Sherry was brave enough to monkey around on the panels. I refused to even look down them! Grant was as reluctant as I was but did stand on one of the panels. Sherry promptly grabbed him and he latched onto a nearby handrail as if he were about to plunge through the glass lending credibility to my strong belief that Sherry would have done the same thing to me if I had agreed to stand on a panel. I can assure you someone would have been performing CPR on me! We almost had to do so to Grant. But, the view was breathtaking as the photos reveal and well worth my trepidation. 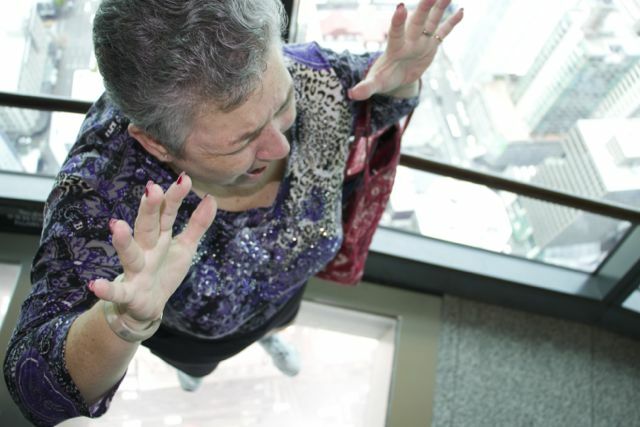 Sherry did comment once during our time at the top of the tower that I seemed a “little pale”. You think! Let me pause for a moment and acquaint you with some Kiwi phrases. You go to the “loo”, not the bathroom. You throw trash in the “rubbish” can. Vanilla ice cream with caramel and toffee is called “hokey pokey” ice cream. While still thinking of the Sky Tower, a funeral parlor here is known as a funeral “cottage”. An expresso with a little less milk than a latte is known as a “flat white”. I had two of these today and I am now convinced Starbucks should add this to their menu. New Zealand loves coffee shops. There must be a thousand little niche coffee shops all over the city each with their own unique brand of coffee. 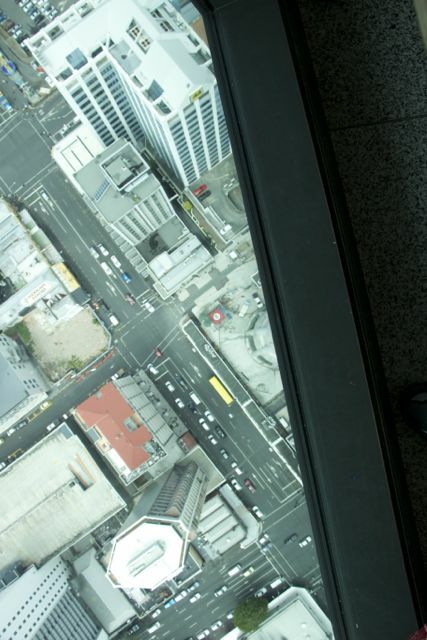 The young man on the Sky Tower Free Fall must have soiled his “nickers”. Don’t call your belted travel pack a “fanny” pack. Fanny refers to something to do with anatomy that I cannot speak of in mixed company. You don’t tip in New Zealand. Rather, you say “Thank you very much for your service.” and that is sufficient. Also, the check isn’t brought to your table. You must go to the “registration desk” and pay for the check. Grant had what we would call a chicken fried steak only with pork known as a “pork schnitzel” with “chips” meaning french fries. Carbonated water is “moving” water and non carbonated is “still” water. 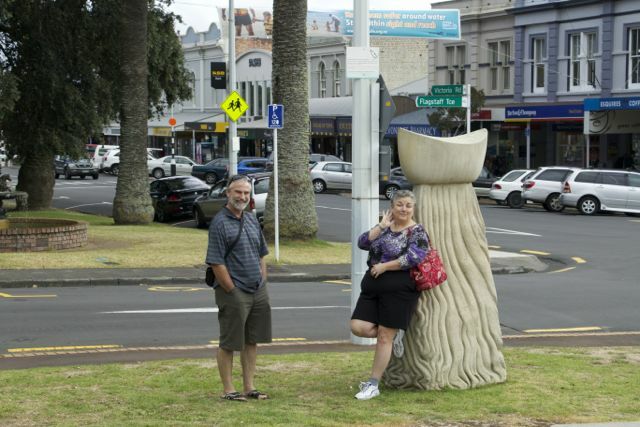 There is no such thing as ice tea in New Zealand we discovered and is sorely missed by this Southern couple. Enough for now. I’m sure I will share more of these words in the future. We set off downhill after the Sky Tower, thank you Jesus and I mean that reverently, back toward the harbor. We bought a ticket for the ferry to take us across the harbor to the far peninsula to an exclusive area known as Devonport. 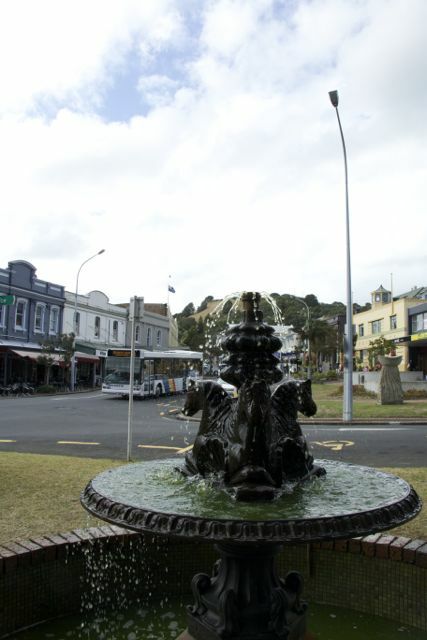 Built during the Victorian era, the village has retained its architecture and is now filled with small, exclusive shops and restaurants and, yes, dozens of coffee shops. To finish off today’s post, here are some photos from Devonport including one area of a small beach overlooking Auckland downtown and, of course, the Sky Tower. By 530 PM Kiwi time (add 5 for hours plus one day) Sherry was exhausted and we headed back to have “tea” meaning supper at an Irish Pub, O’Hagan’s. This is where Grant had his pork schnitzel and Alex had steak and eggs — a huge slab of steak topped off with two poached eggs and chips (remember, these are french fries. Remember this so I won’t have to keep reminding you!) I had a hamburger with cheese and bacon. But, their bacon is more like our thick cut bacon with lots more meat than fat only not at all fried crispy. But, it was quite tasty as you can imagine. By this point I was pushing six miles of walking and had only eaten a scone with my flat white since breakfast so I indulged. We had nachos with rich New Zealand beef chili, cheddar cheese, salsa, sour cream, and guacamole on top of corn “crisps” (this would be what we recognize as chips) in a skillet. It was MOST yummy! Sherry had chicken quesadillas. Let me just say that I have eaten in Canada, Mexico, France, and England. The food was most bland in the United Kingdom followed closely by Canada. Mexico’s food for me has had the same effect on my body as the Sky Tower Freefall had on the aforementioned young man! France’s food was very buttery and very winey?! ?, if that is a word. Sherry packed a can of Tony’s spice in case New Zealand food was similar to the UK. So far, we have had some of the most delicious food! Far too much of it, in fact. 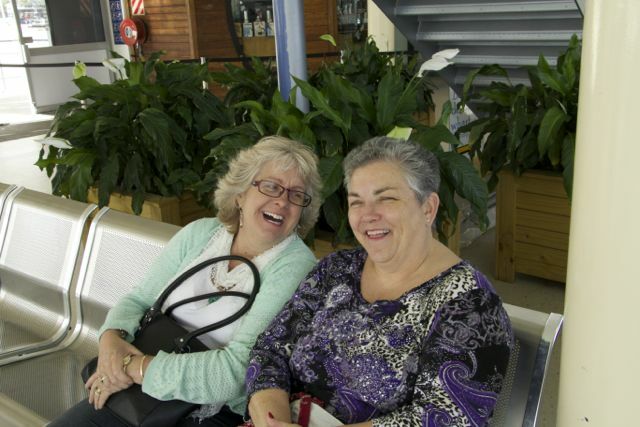 Finally, here are the two girls sitting on the bench waiting for our ferry to take us back to Auckland and the end of a very exciting, but tiring day. Tomorrow, it is off to the cave of the glowworms! Good on you, Mate! 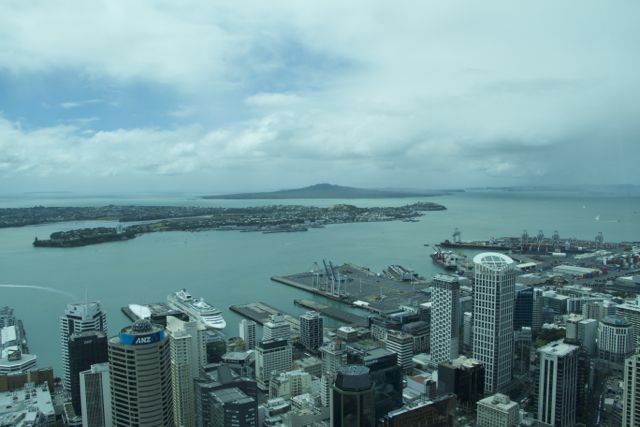 Posted on March 3, 2014, in Breaking News, My Writing and tagged Auckland, Devonport, New Zealand, Sky Tower. Bookmark the permalink. 1 Comment. Bruce, great stuff. I laughed till I cried at several things (which I shall not enumerate here).